This post helps you to understand how to get Windows 10 upgrade notification on Windows 8 or Windows 7 computers. 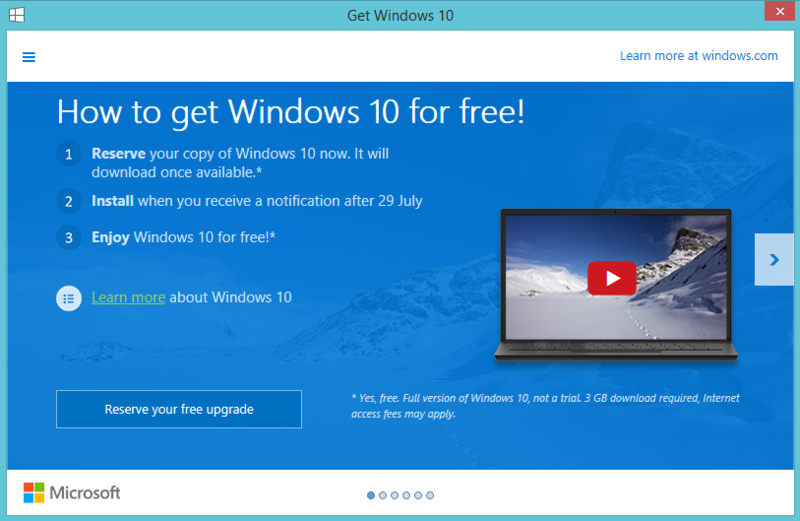 As you might already aware, Microsoft announced free upgrade to Windows 10 for customers who are already running windows 8 or windows 7. There are some pre-requisites which your computer should meet in order to get this free upgrade. Let us take a look at them and also understand how to register for the free upgrade if your computer OS meeting the pre-requisites. You should be running with one of the blow operating systems in order to get free Windows 10 upgrade. Have you noticed the above properly? Yes, you should have Windows 8.1(not Windows 8) to get free upgrade. If your computer is running windows 8, you can upgrade it to windows 8.1 without any additional cost. There are many articles in web which can help you for this upgrade. Take a look at http://windows.microsoft.com/en-sg/windows-8/update-from-windows-8-tutorial link which covers most of the information. Similarly you should have SP1 installed if your Computer is running Windows 7. Once you meet the above pre-requisites, your computer is ready for registering to free Windows 10 upgrade. If you Windows update is running on your computer and it has internet connectivity, by this time you might have already noticed below type of icon in your system tray. In case you are not seeing something similar to this, then you must ensure your system is up to date with Windows Updates. Your computer must have Windows RT 8.1, Windows 8.1, and Windows Server 2012 R2 update: April 2014 (KB2919355) update installed which is pre-requisite for actual update that installs the icon in System tray. If this is already available, then look for Update enables additional capabilities for Windows Update notifications in Windows 8.1 and Windows 7 SP1 (KB3035583)which installs this system tray icon which helps in registering for free Windows 10. Once you start noticing above icon in System tray, registering for the Windows 10 is straight forward. Just click on the icon in System tray and it opens up below window. Click on Reserve your free upgrade to complete the registration. When I clicked on it, it didn’t give me any confirmation about the registration. So, I right clicked on upgrade icon in system tray and went to Check Your Upgrade Status and it gave me below window which confirmed my upgrade registration. Optionally you can enter your email address here and click on Send confirmation you have a email confirmation sent about Free Windows 10 Upgrade. 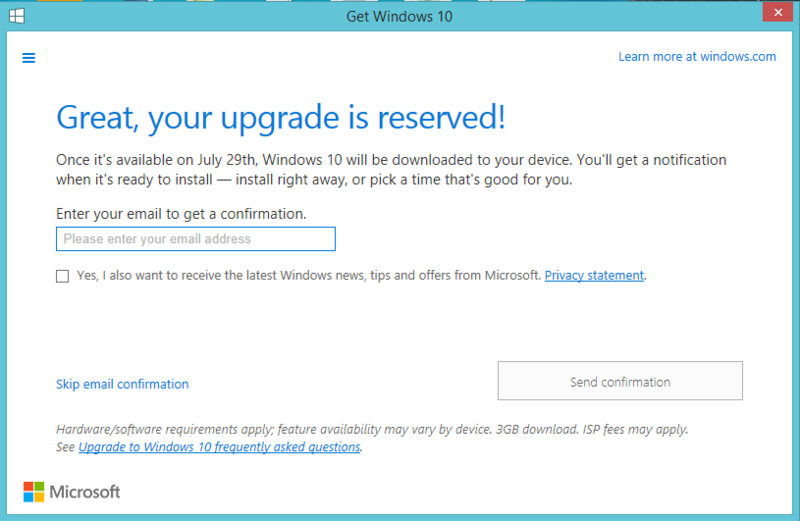 As you can read from the upgrade registration window, the upgrade will be made available from July 29th onwards through Windows update. Make sure you have sufficient bandwidth to download the update. It is expected to around 3GB. I will make a followup post after July 29th once my computer is upgraded. If you have any questions about how this upgrade, please feel free to write in comments section. I will get back when I get chance.